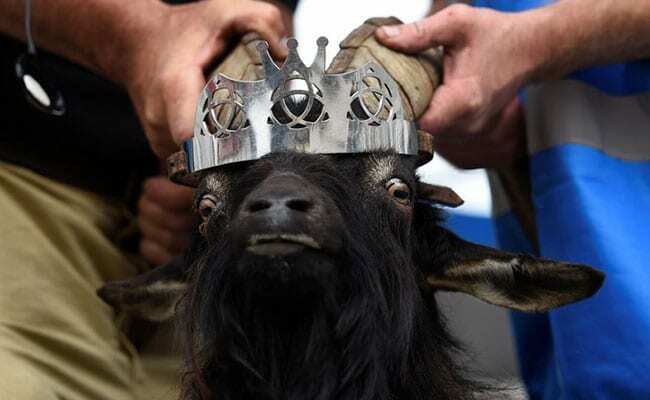 Billed as one of Ireland's oldest festivals, the Puck Fair sees locals in the town of Killorglin pluck a wild mountain goat from its habitat and crown him 'King Puck' for the duration of the event. The Puck Fair, one of Ireland's oldest festivals, sees a mountain goat being crowned for the festival. Killorglin, Ireland: For a few days this week a goat will be king of a small town in Ireland's rural south west. This year's king was paraded through the town on Thursday, where he was crowned by the Queen of Puck - an honour bestowed on a local schoolgirl. He appeared relaxed, if occasionally bemused, during his coronation. "I've seen it for the last 11 years so it's nothing new but when I first moved here from England I thought it was strange," festival-goer Ben Henry, 25, of Killarney told Reuters. "I heard a fella today saying he's been coming to Puck for 57 years so that says a lot!" he added. The festival will feature music, street performers and a horse fair. The origins of the event are unclear, though there are many local theories from a harvest festival to tales of a lone goat fleeing Oliver Cromwell's troops into the village. Organizers say historical references to the festival date back to the early 17th century. As for King Puck, organizers say he is to be treated royally during his brief reign with a diet of ash tree branches, water and cabbage to sustain him until he returns to his mountain home following his dethronement ceremony. Organisers expect to welcome more than 100,000 visitors during the festival which runs until Aug. 12.